After Barack Obama in 2012 won reelection, Trump declared his win “a total sham and a travesty” and called for a revolution and march on Washington. Trump was wrong; Obama actually won the popular vote over Republican Mitt Romney by 5 million votes, and carried the Electoral College, 332 to 206. In 2016, Trump lost the popular vote to Hillary Clinton by some 3 million, but carried the Electoral College with 304 votes. 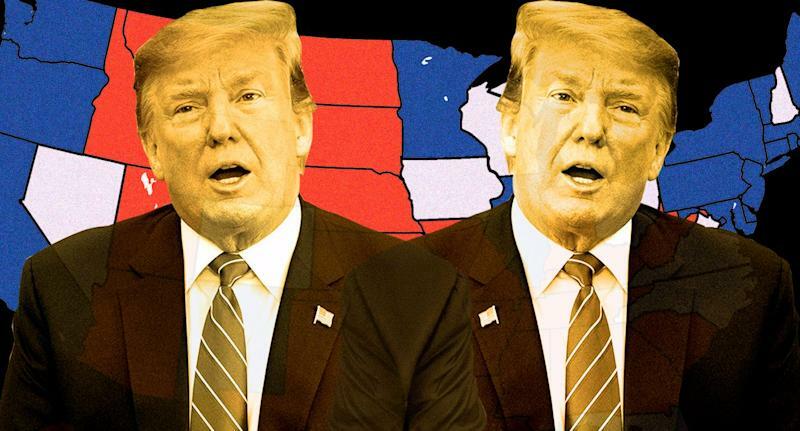 He has tried to exaggerate the significance of his victory by claiming the Electoral College is stacked in favor of Democrats, although most political scientists believe the opposite. “I used to like the idea of the Popular Vote, but now realize the Electoral College is far better for the U.S.A.,” Trump wrote Tuesday night. However, his recent switch comes after Democrats, including presidential candidates Elizabeth Warren, Pete Buttigieg and Beto O’Rourke, have called for ending the Electoral College and choosing the president by popular vote. “Come a general election, presidential candidates don’t come to places like Mississippi, they also don’t come to places like California or Massachusetts, because we’re not the battleground states,” Warren said at a CNN town hall on Monday. “My view is that every vote matters, and the way we can make that happen is that we can have national voting and that means get rid of the Electoral College, and every vote counts,” she said to an extended ovation from the audience. Because of the Electoral College, swing states like Florida and Ohio receive greater attention by presidential candidates. While states under the Constitution have the power to determine who gets their electoral votes in national elections, a majority of states give all their electoral votes to the presidential candidate who receives the most votes within that state. Eliminating the Electoral College would require a constitutional amendment, which would need a two-thirds vote in both chambers of Congress and ratification by three-fourths of the states. But Democrats have proposed another option. As of last week, 12 states that are mostly Democratic strongholds and the District of Columbia signed on to the National Popular Vote Interstate Compact, pledging their Electoral College votes to whichever candidate wins the national popular vote. The bill would take effect if the law is passed by states controlling at least 270 votes, which is the figure needed to win the presidency. It currently has 181. Trump is one of five presidents to win a presidential election while losing the popular vote. In 2000, Democrat Al Gore won by over half a million popular votes, but lost Florida in a disputed recount by a few hundred votes, and the presidency went to George W. Bush.